Everyone’s a winner at Radio B•I•N•G•O! 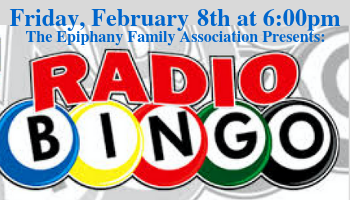 Please join us in the Parish Hall on Friday, February 8th at 6:00pm for The Epiphany School’s annual game night. The EFA presents Radio B•I•N•G•O, a combination of “Name that Tune” and Bingo. It promises to be an evening filled with good music and good friends. Pizza and drinks will be served.